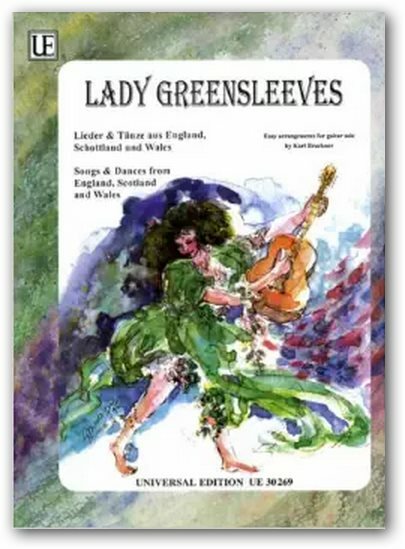 "Green Sleeve - Traditional English folksong at least as old as Shakespeare..."
Being in the key of A minor also gives it a melancholy twinge which is quite appealing. Play this tune at a leisurely pace. First of all you'll need to master is in the 8th and 16th bars. You need to hold the G sharp with your first finger whilst you reach out with the 4th finger of the left hand and play the F sharp on the fourth string, fourth fret. The G sharp is played again immediately after the F sharp so you'll have to hold onto the note by extending or stretching. The next roll I employ is in bar 14 where the same "G" chord is played. The difference is that my thumb and fingers are sounded on the strings slightly one after another. It takes a bit of skill and practice to make achieve a consistent "roll' like this but it is a skill certainly worth the effort.